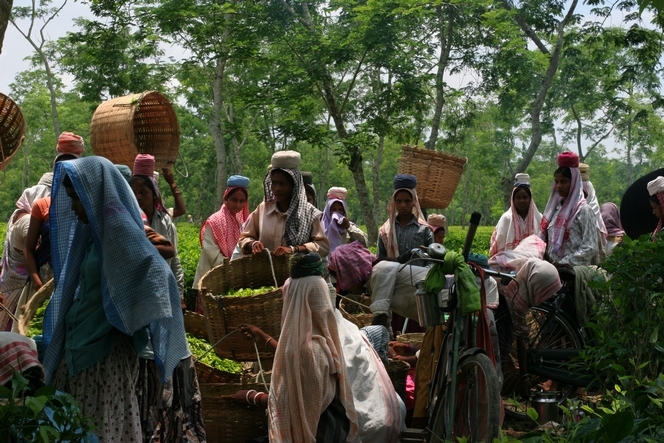 In Assam, as soon as harvesting is finished, the pluckers assemble, men on one side, women on the other, and they set off with their precious baskets to the place where they will be weighed. Some women hold their baskets under their arms, but most rest them on their heads. A rolled-up piece of cloth placed precisely on the crown of the head serves to support the basket. These splendidly colourful fabrics look like crowns, making their wearers look like queens, I think.